Injured Nottingham Forest striker Britt Assombalonga says the motivation of hearing supporters "roar" at the City Ground has helped keep him focused on returning to action this season. 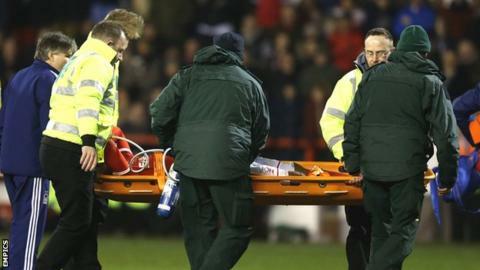 Assombalonga dislocated a kneecap in the 3-0 win over Wigan in February and was ruled out for at least 12 months. The 23-year-old told BBC East Midlands Today he is doing light work on the treadmill and making steady progress. "The knee's good. It's getting there," Assombalonga said. "There is no date for my return but it will be this season. "It is frustrating because all I want to do is play football. I am desperate to come back and put the ball in the back of the net. I want to hear that roar at the City Ground again." Assombalonga, who joined from Peterborough United for £5.5m in August 2014, had scored 15 goals in 27 Championship starts for the Reds when he was injured taking a shot against the Latics. "I heard a big pop and I started crying. It was the worst pain ever," Assombalonga said. "I could see my knee out of place. It's one of those things. "When I was told it would be a year, I knew it was coming so I was prepared. I knew I would be out for a long time."